Welcome : A lovely welcome from Marie-Christine & her husband Dominique, with a complimentary drink in the lovely garden. A non-stuffy but nicely formal atmosphere. 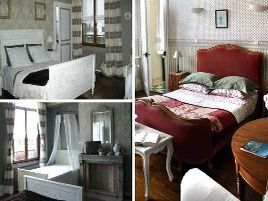 Room : Lovely rooms - 'Old France' shabby chic, big gothic mirrors etc. Our bathroom was fine; clean and a great shower. It was great having the kids ensuite but separate. 55 € the night I book ! In the heart of this milti-faceted town, labelled a 'City of Art and History', Véronique and Bruno welcome guests to their town house dating from the end of the 19th century, which has retained all of its splendid standing intact. Private, leafy garden. Between town and marais, the rooms are spacious and comfortable, reflecting the serenity of the setting. In the morning, a hearty breakfast table is laid either around the crackling open fire in winter or on the veranda in summer. Friendly welcome. A great address!. 1 suite and 2 rooms with shower, WC and TV. From 54 euros (1 pers. ), 60 euros (2 pers. ), 69 euros (3 pers. ), 112 euros (4 pers.). Extra bed 15 euros. An apartment also for rent. Baby equipment, babysitting, games. For teenagers: table football, pool table, silk-painting, the town close by. A family suite, spacious and good value. The closest station is Sur place, located at 0 km. The closest airport is Lille, to 65 km.